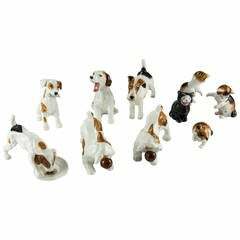 Collection different animals by Herend. Each stamped on the bottom. Smallest item (bunny) measures: 3.5 inches x 1.25 inches. Collection of many Malachite stones, all polished. Sizes and shapes all very and unique. 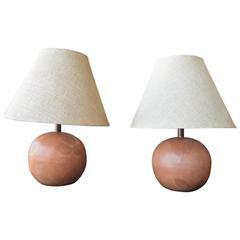 Pair of terracotta lamps. With leaf imprints on the base. Pair of German porcelain models of parrots with mark at the bottom. Terracotta Art Deco figurine of a fish signed R Rodes. 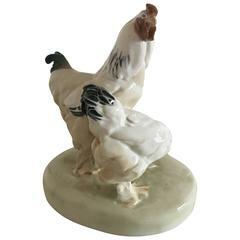 Meissen figurine of two chickens. Measures: 22 cm H (8 21/32"). 18 cm diameter (7 3/32"). The chicken in front of the rooster chicken has a minor reparation on its tale. 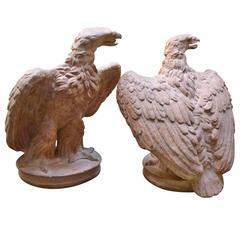 This stylish Art Deco style piece was sculpted by Frederich Gronau and produced by the Rosenthal of Germany. The piece has a smooth bisque finish and a soft white coloration.